Jewish delis are having a big moment right now, as people everywhere are interested in experiencing food traditions of the past. Fermentation, curing, pickling, and meat-smoking are in the spotlight, making Jewish delis from coast to coast a destination for newcomers and serious deli lovers alike. Here, we celebrate some of our nation’s oldest, most celebrated Jewish delis, as well as the new ones that have cropped up to fill the gaps. In making this list, we sought delis with Jewish roots, serving standards like matzah ball soup or overstuffed sandwiches — kosher or not. Some are Jewish-owned, while some are owned by folks whose appreciation for Jewish food and culture run deep. Wondering about the Jewish delis of Alaska, Montana, South Dakota, Vermont, West Virginia, and Wyoming? 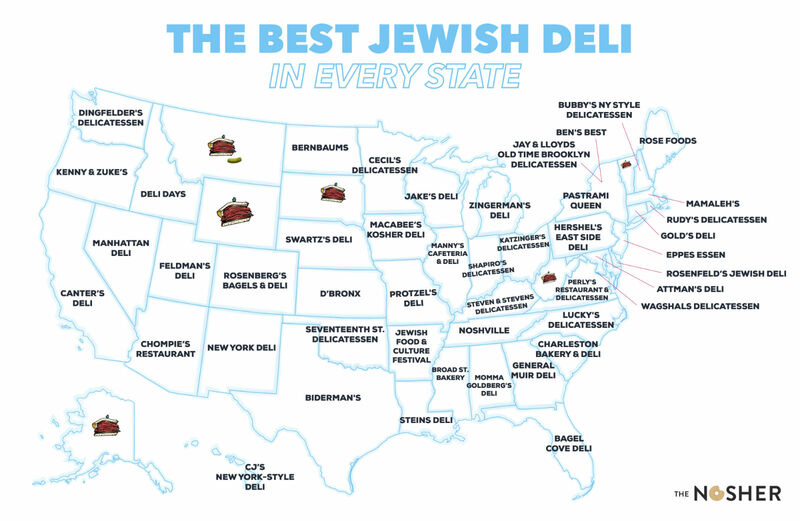 We couldn’t uncover any distinctly Jewish delis in these states, so we need your help! Send us your recommendations. The closest thing to a Jewish deli in Alabama is this deli chain that serves ham alongside pastrami, between two slices of Jewish rye, with a whole kosher pickle. The popular chain is named after a friend of the owner, Mr. Goldberg, and there are 23 locations throughout Alabama, South Carolina, and Georgia. Lou and Lovey Borenstein moved from Rosedale, Queens to Phoenix in 1979, where they became the first bagel factory and Jewish delicatessen in the desert. According to the incredible mini documentary about them, one of their first visitors was moved to tears upon seeing an egg cream on the menu. They truly have everything covered here, from freshly baked challah to New York-style pastrami, smoked fish, and matzah ball soup. The best Jewish deli food in Arkansas can be found once a year at a popular Jewish food and culture festival in downtown Little Rock. On hiatus for 2018, the next festival will be held on Sunday, April 19 of 2019. There, you can spend an afternoon listening to klezmer music while noshing on some of the best cabbage rolls, corned beef sandwiches, and blintzes the South has to offer. With iconic 1950s style booths, an instagramable art-deco ceiling, and all the Jewish classics served 24/7, Canter’s is the old-school deli of your dreams. 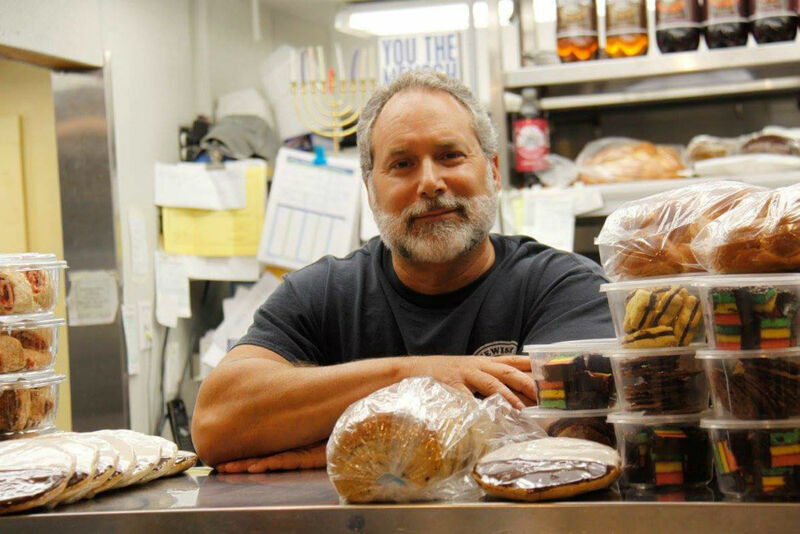 Since 1931, Canter’s has been one of the most beloved delis and Jewish bakeries in the US, leading the way for the aspiring deli-owners of today. Longing for the food he grew up with, a New Jersey transplant founded this Colorado deli in 2014. Here, you can have thick slices of house-cured corned beef on freshly baked rye or his signature bagels, which the New York Times says are among the best in the west. Gold’s has been a Westport staple since 1958, and few things have changed since then. They receive daily deliveries of bread from New York City, and have a deli case stocked with Hebrew National meats. Their nova lox, fresh from Norway, is noted by locals as the best in the area. Filling a void of Jewish delis in Delaware sits Rosenfelds, a spunky deli on the Delaware shore with Yiddish-infused deli sandwiches like The Schlepp (pastrami, brisket, and corned beef) and dinner favorites like stuffed cabbage, matzah ball soup, brisket, and latkes. The Bagel Cove goes beyond the bagel and includes brisket, matzah ball soup, chopped liver, pastrami, latkes, and more. You won’t want to miss the egg salad or whitefish salad especially. Their outdoor dining room, bordered by palm trees and a garden, is a truly Floridian take on the Jewish deli. This modern Jewish deli joins the ranks of our nation’s best, serving up New York-style favorites as well as fresh takes on the classics, like their vegetarian reuben, where smoked beets replace pastrami. The restaurant is named after the refugee transport ship that brought the owners’ grandparents and mother to New York in 1949. Fulfill your matzah ball soup cravings at this island deli, where pastrami and sauerkraut appear on the menu next to Hawaiian favorites like kalua pig. Obviously not kosher, but it’s a mighty fine place to enjoy a brisket sandwich on the island. Without a deli in town, a Boise synagogue decided to start their own Jewish food festival, where once a year, they serve up kosher pastrami and corned beef sandwiches, make gefilte fish, and offer plenty of baked goods for the community. This festival happens once a year, every June, so plan ahead! This old-school, family-owned deli offers one of Chicago’s most unique dining experiences, as a cafeteria-style restaurant 52 years in the making. The old meets the new in this recently renovated deli, where you can grab a Colombe coffee as you admire the memorabilia on the walls and wait for your bialy or deli sandwich. They also serve some of the best homemade kishke, stuffed cabbage, and corned beef you’ll ever find. Iowa’s only Jewish deli is 100% kosher, with dozens of sandwiches and traditional sides like knishes, stuffed cabbage rolls, and kugel. The deli doubles as a kosher grocery, so it’s a one-stop-shop. At d’Bronx, the food is as authentically New York as the name of the restaurant, which was started by a deli family from the Bronx. Here you can have New York-style pizza and kosher-style classics, like matzah ball soup and house-roasted brisket or pastrami — a true fresser’s paradise. The owners of Steven and Stevens knew, while planning the deli of their dreams, that drawing inspiration from Jewish deli tradition would help them avoid being “just another sandwich shop.” Their menu, 25 years later, reflects this philosophy with pastrami and roast beef sandwiches named after Jewish celebrities, and matzah ball soup served daily. New Orleans’ eclectic Lower Garden District is home to Stein’s Deli, an Italian and Jewish-style deli that imports bagels from Davidovich in NYC’s Lower East Side. The menu includes old-world classics like beef tongue, chopped liver, and knishes, which you can order alongside an adventurous craft beer or artisanal coffee. Part of Portland’s Jewish food renaissance, Rose Foods serves up locally-sourced and inspired Jewish classics. The sandwich menu is refreshingly uncomplicated, with two meat options — either corned beef or pastrami, with reuben possibilities — on house-made rye. Since 1915, Attman’s Deli has been at the center of Baltimore’s Jewish community on a stretch of Lombard Street known as “Corned Beef Row.” This landmark has been in the family for four generations, who are passionate about making the best corned beef, hot pastrami, and brisket in town. This is a great spot to try less-obvious choices like homemade kishke, pickled plum tomatoes, homemade liverwurst, or beef tongue. This modern Jewish restaurant wins us over with their liberal use of Yiddish and their old-world specialties like gribenes, schmaltz, kugel, knishes, and kreplach. The decor — with tiled floors, a soda counter with bar stools, and comfy booths — makes this a nostalgic deli experience in every way. Read more about Mamaleh’s in our recent article here. Zingerman’s, a bakery and deli, makes what some call the best Jewish rye bread in the country, made in the “Detroit double-baked method,” which was invented by Stage Deli as a method of guaranteeing a fresh, flavorful deli bread. Slightly under-done loaves are finished in the oven right before serving, releasing more flavor and a softer texture as you bite into your sandwich. Order your favorite sandwich in a “nosher” or “fresser” size, and discover the true meaning of rye bread for yourself! Since 1939, the Glickmans have been serving up Minnesota’s best Jewish food at Cecil’s. We included them in our lineup of the best hamantaschen in every state, so it’s not surprising that their deli is also number one. Their black and white checkerboard floor tiles, deli case filled with a plethora of meat, salads, and cheeses, and Yiddish-influenced menu items make this old-school deli a winner. Coming from a long line of Jewish bakers, the owner of Broad Street Bakery is proud to offer fresh breads and deli classics in Jackson, Mississippi in the only Jewish deli for miles. The menu includes a roast beef sandwich with horseradish mayonnaise and a reuben panini amid plenty of options that are distinctly Southern. The bread menu boasts a number of artisanal breads, with two types of rye bread and a challah on Fridays. I took @prinziel to Protzel’s Deli so she could experience what being a good Jewish girl is all about: eating pastrami reubens, a potato knish, gossiping, then napping. Decorated with memorabilia from decades of deli ownership, Protzel’s is a no-fuss neighborhood treasure. You can find their deli case brimming with knishes, a number of salads, kosher roast beef, pastrami, and salamis. With an instagrammable robins-egg blue interior and shelves stocked with Jewish staples like mustards, jars of holiday foods, pickles, and candy, this spot is not to miss. In the middle of the Jewish deli void that is the Midwest sits Swartz’s, where you can find the best bagels and hard-to-find foods like chicken soup with kreplach, kosher deli sandwiches, chopped liver, knishes, and kugel, all 100% house-made. The retro checkered floor tiles and stylish booths will make you want to linger here for a while. Located inside Reno’s Atlantis Casino is Manhattan Deli, where you’ll find a circular-shaped dining area with cherry-red cushioned chairs and black and white tile work. They’re known for their picture-perfect matzah ball soup and sandwiches heaped with pastrami. Any deli that has a Yiddish glossary is one we’ll get behind. Here, they decode a number of foods (lox, knish, kugel, schmaltz) along with the words that go with them (nosh, fress, schmooze, oy vey). The food itself looks incredible, and with breakfast, lunch, and dinner options — and a dog-friendly seating area — they have it all! Eppes Essen, which means “I will give you something to eat” in Yiddish, has been a New Jersey favorite from the start. For over 50 years, they’ve been serving generous sandwiches — several triple decker options — piled with house cured meats and slaw, alongside sour pickles. The owners of this New Mexico deli are Brooklyn transplants, trained at a young age in the art of bagel and bialy making by their father, a Polish-Jewish immigrant who owned bagel shops in the Bronx and Queens. Their expansive menu features sandwiches named after NYC neighborhoods, plenty of deli sandwich options, and for breakfast, blintzes, bagels, and schmears. This tiny kosher deli is among the few that still make their pastrami from scratch, with an age-old recipe and plenty of garlic and crushed peppercorns. Former New York Times food editor Mimi Sheraton says it’s the best, and we can’t disagree. We recommend the pastrami on rye with a side of french fries topped with garlic flakes. Attention all hotdog lovers! 🔥🌭🔥 Meet Llyod from @jayandlloydskosherdeli who make —the— best hotdogs in all of NYC! You can tell he means business from the hotdog hat he is fashioning. You can tell that this kosher deli prioritizes fun just as much as the food — there’s a neon dancing hot dog in the window, and Lloyd is frequently wearing a stuffed hot dog hat. They cure all of their meat on the premises, and their menu is full of overstuffed sandwiches and inventive spins on the classics, like “franks in jackets,” and four types of knishes. 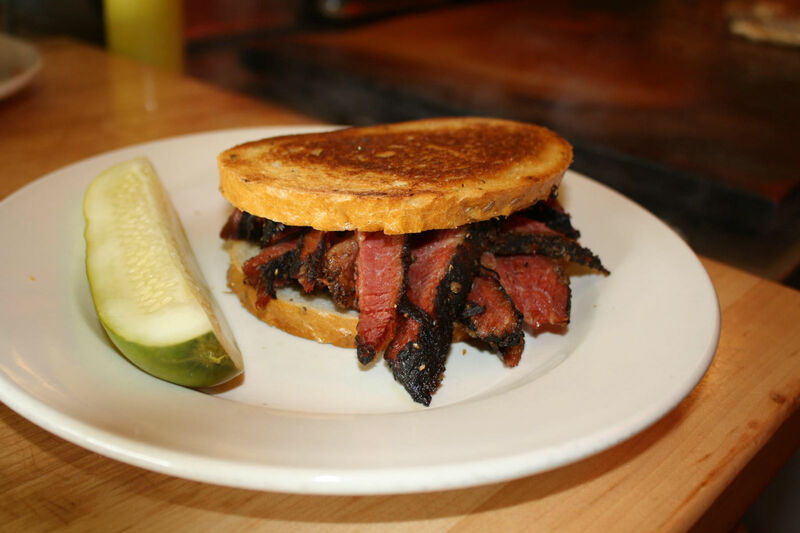 Ben’s Best pastrami smokes over a low flame all day, so that the meat remains juicy with a flavorful finish. Now in its third generation, they’re making “things as they were,” with recipes handed down from their Polish and Russian ancestors. At this new-school Jewish deli in Durham, you can have a classic matzah ball soup and a deli sandwich, or switch it up and have one of their creative, seasonally-inspired sandwiches, which truly look like works of art. The deli concept is a hit in Durham, and the line of Lucky’s often stretches out the door. Known for their bagels (see them in our best bagels in every state article), this tiny restaurant makes excellent food in the spirt of the Jewish deli, with an Upper Midwest accent: There’s chopped liver dressed up with apple compote, blintzes with lingonberry sauce, a seasonal knish, potato latkes with creme fraiche, and carrot horseradish. Family owned since 1984, Katzinger’s just might be the deli of your dreams. They’re part deli, part grocer, with a wide variety of meat and fish, breads, and cheeses in their well-curated specialty foods department. They’ve seen generations of families gather and establish traditions here, and they’re proud to be involved in their community at this level. The team behind this Portland deli spent years developing their pastrami recipe, and with this old-school approach they proceeded to draft their own recipes for pickles, rye bread, challah, bagels, and bialys until their entire menu was made from scratch, the way it should be. Tucked away inside of the Reading Terminal Market is a deli steeped in Eastern European Jewish tradition. The owner grew up working with his uncle, a chef at Katz’s deli, and fell in love with the deli world. Hershel’s is dedicated to making everything from scratch — their meats hang in the basement walk-ins and once it’s ready, meat is carved to order. Chicken soup, latkes, kugel, knishes, and cheesecake also grace their impressive menu. This three-generation Jewish deli is family-run, with each member adding their skills to the business. The deli sticks to the classics, with brisket, beef tongue, and reuben sandwiches, matzah ball soup, and knishes. This southern deli serves serious deli-lovers and first-timers alike, with several Jewish standards and some globally-inspired dishes like Cubans, french dips, and gyros as well. The only deli in town, they’re proud to offer authentic Jewish food to a generation that’s less familiar with the old-world cuisine. We love good wordplay, especially when it involves “nosh.” Here at this popular Nashville deli you can find quintessential Jewish deli fare — sandwiches, matzah brei, black and white cookies, egg creams, and knockwurst — or enjoy a Tennessee club, a riff on the BLT. Started by the owner of Austin’s popular Seventh Flag Coffee, Biderman’s brings a much-needed deli to Austin. With delicious homemade bagels (they made our list of the best bagels in every state), freshly baked bread, and delicious meat or vegetarian sandwich options, Biderman’s will not disappoint. This cozy ski chalet-inspired Jewish deli serves mountains of pastrami packed between slices of lightly toasted rye, and goes the extra mile with pierogi, bagel beignets, and pickles shipped in from Brooklyn. We’d be remiss if we failed to mention their events, which include acts like “Old Jews Telling Jokes Night” and a baudy blues and ballad singer named Deli Man. Perly’s offers a fresh modern take on classic Jewish food and ingredients, and serves it up in style. The Jewish egg rolls sound especially mouthwatering — filled with corned beef, kishke, sauerkraut, and topped with honey mustard and schmaltz. This is the sort of smart approach to updating the classics that they take, and you see it everywhere you look in this vintage wallpapered, Yiddish-accented modern deli. Seattle just got its first New York-style Jewish deli, which is currently operating as a deli-style caterer until they officially open in July. Run by a New York transplant and his wife, who have been catering weddings, bar and bat mitzvahs, and family events, their brick-and-mortar is sure to be a hit. This celebrated, historic Milwaukee eatery is one of the only remaining Jewish delis in the city. It was opened in 1903 as a butcher shop, and transformed into a deli in 1955. As the neighborhood around it changed, support for the deli remained strong, committed to serving delicious corned beef and pastrami sandwiches for the neighborhood.